Taormina is one of the most magical places in Italy! The enchanting town clings atop a steep lush hillside and hangs right over the sparkling Ionian Sea. The massive snowcapped Mount Etna looms in the horizon. Located on the Eastern coast of Sicily, north of Catania, Taormina is the jewel of the island. The village is full of delightful 18th-century villas, charming cobblestoned laneways, high-end boutiques, antique shops, wine bars, perfumeries, and romantic ristoranti. You can enjoy dramatic sweeping views over the coastline’s beaches and coves from many nooks and corners in Taormina. This beautiful and wealthy Sicilian town has a long and fascinating history. The Greeks founded trading colonies on the island as far back as 735BC and built wonderful towns such as Syracuse, Agrigento and indeed Taormina (then called Tauromenion). We can still enjoy the surprisingly preserved Ancient Greek Theatre of Taormina, perched overlooking the entire bay in a magnificent natural environment. 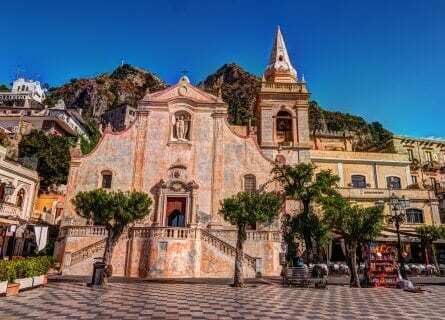 Taormina was a rich trading center and eventually came under Roman rule and when Rome fell, became an important hub during the Sicilian Byzantine period. Later conquerors and inhabitants included the Arabs, Normans, Spanish, and French (under Napoleon) until finally Sicily was incorporated into greater Italy. The architectural and gastronomic influences of so many cultures are evident today. For foodies and wine lovers, Taormina is a “must do” as it is home to some of the best restaurants in Sicily and on the doorstep of Mount Etna where some of the most exciting wines in Sicily are being produced. We have designed this luxurious tour in Sicily for guests looking for gorgeous scenery, stunning food and wine, charming accommodation, and private driver guide. Contact us for more information on this unforgettable tour. Arrive at Catania airport, and your own charming driver guide and Mercedes will be waiting for you. Transfer north to beautiful Taormina and settle into your luxurious boutique hotel, a converted small palazzo overlooking the sea. Take some free time to enjoy a glass of wine waiting for you in your room, have a siesta or a revitalizing bath (the hotel has wonderful bathtubs) and in the early evening, your private guide will collect you at the hotel to take you on a “gourmet walking tour” of Taormina. Discover the most beautiful little shops and pick up some gifts such as Modica chocolate, Trapani sea salt, “Martorana” Fruit (made with Marzipan), fine olive oil, or perhaps some rare Sicilian wines from Pantelleria or the Aeolian islands. Your guide will take you to the best place in Taormina for some wonderful and sinful cannoli and a glass of bubbly, and you will finish with a visit to the stunning Ancient Greek Theatre at sunset. Tonight you have an outstanding welcome dinner waiting for you at one of Taormina’s gourmet havens, enjoy! 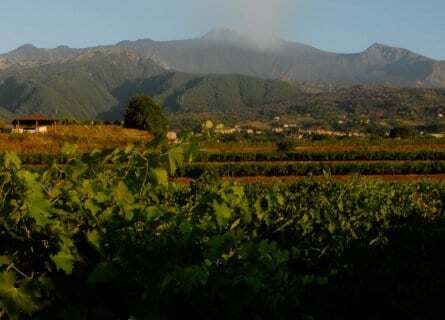 Today is a wonderful wine tasting excursion to volcanic Mount Etna! But first enjoy an outstanding breakfast at your hotel, one of the best in Italy. Enjoy views over the sea while tucking into a fabulous breakfast with fresh squeezed Sicilian red- blood orange juice of course. From Taormina, your driver will take you south towards the volcanic Mount Etna, a fertile paradise for winemaking and Sicily’s most exciting wine region at present. Apart from vineyards, the pretty countryside around Etna is home to abundant chestnut groves, peach and lemon trees, wild wisteria and artisan honey making. Local grape varieties in the interesting DOC Etna appellation include Carricante, Lucido, Catarratto, and Minnella Bianca (white); and Nerello Cappuccio and Nerello Mascalese (red). Nero d’Avola is also found in many cru reds. There are a multitude of fine producers here from trailblazing Benanti, high-end Tenuta Delle Terre Nere, the friendly Murgo estate, the famed Cottanera and many more. The lead singer of Simply Red Mick Hucknall also has a cult wine here in Etna called Il Cantante (legendary Salvo Foti is his winemaker). 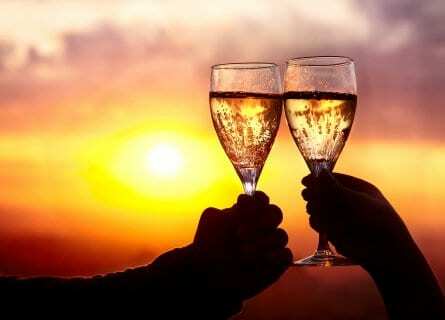 You will visit two wonderful wineries and receive VIP private visits and superb tastings. Lunch will be in the wine country of course and will feature delicious regional Sicilian specialties paired with excellent local wines. Arrive back to Taormina in the evening, and enjoy a relaxing night on your own with our suggestions. After a leisurely breakfast, today is yours to take in some sightseeing, shopping, and dining on your own in glamorous Taormina. Enjoy a stroll up the Corso Umberto, the main pedestrianized thoroughfare in town and pick up some gourmet gifts and perhaps stop for a coffee and cannolo. Nip into the very pretty Duomo and enjoy the sea views from Piazza IX Aprile. Before lunch, enjoy an aperitif on the simply stunning terrace of the Grand Timeo, directly overlooking the sea and Etna. Bring the camera, as the views are breathtaking! Taormina has an array of restaurants, you are literally spoiled for choice, and depending on if you want something rustic and homey or chic and Michelin starred, we’ll make suggestions for you. In the afternoon, depending on the month, you could head down to beautiful Isola Bella for a swim in the Caribbean style waters. The area is now a protected nature reserve and is home to many different bird species. The evening is yours tonight with our suggestions for dining. Today your charming driver guide and comfortable Mercedes will pick you up at your hotel in Taormina to transfer you to Catania airport. Depending on your flight time, we could also fit in some more sightseeing for example right in Catania’s historic center or in some nearby medieval villages. We hope you had a marvelous tour and look forward to seeing you again!